Golden Tate celebrates as he runs off the field following the Eagles' win on Sunday. 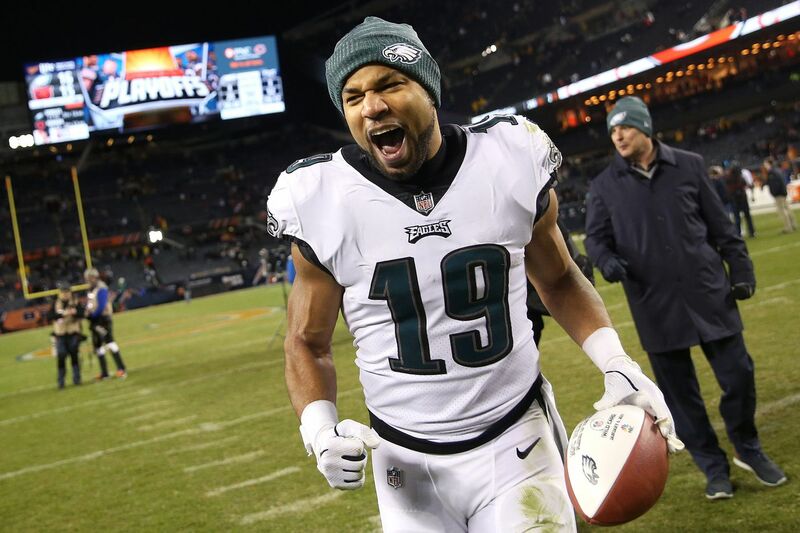 CHICAGO – With 56 seconds left in Sunday’s first-round playoff game against the Bears, that third-round pick the Eagles gave up for Golden Tate in October officially became a bargain. The 30-year-old wide receiver, who at times in the last 2½ months has struggled to find a meaningful place for himself in the Eagles’ offense, caught the game-winning touchdown in his team’s 16-15 win. “Coming in, in the middle of the season, and trying to learn this offense is not easy," tight end Zach Ertz said. “There definitely have been games when he hasn’t been utilized as much. “For him to have the game-winning touchdown tonight, it just speaks volumes about his character. He definitely could’ve gotten down in the dumps in some of those games when he wasn’t playing early on after we traded for him. But he didn’t." Tate was targeted eight times Sunday, second only to Alshon Jeffery’s nine. He had five catches -- three on third down and the TD on a fourth-and-goal from the 2 -- for 46 yards and the touchdown. After Darren Sproles failed to get into the end zone on consecutive runs from the 2 and a Nick Foles pass to Jeffery fell incomplete, the Eagles were left with one last chance to get into the end zone; one last chance to keep their season alive. Foles sprinted out to the right and Tate ran a quick out route against Bears cornerback Sherrick McManis and the two Eagles made beautiful music together. “That play, there was pretty much one option and that was me," Tate said. “I did a decent job of setting him up and got open and Nick just threw an absolute dime. “If he throws that ball any further in front of me, maybe I can’t get to it. Any further behind me and maybe the DB has a chance to break it up. “But he threw a dime and I had a chance to make a play and secured the ball and got in, and the next thing you know, we’re leading the game." Lane Johnson celebrates with Golden Tate after Tate's fourth-quarter touchdown. Tate came to the Eagles with impressive credentials. He was one of the most productive pass catchers – particularly on third down – in the league during his four years with the Detroit Lions and another four years with the Seattle Seahawks. But being the new kid on the block isn’t easy. Particularly when you become the new kid on the block in the middle of a season. While he spent night and day trying to absorb Doug Pederson’s complicated offense, the Eagles tried to find ways to use their new weapon. Many times, it seemed like they were trying too hard. Complicating matters was the fact the Eagles’ offense seemed to be most productive with “12” personnel, which features two tight ends and only two wide receivers, often leaving Tate as the odd man out. Slowly but surely, he started to find his place in the offense. “There have been some things that have been challenging," he admitted Sunday after the game. “But as far as the people, the receivers have welcomed me with open arms. My first week here, Jordan Matthews invited my wife and me and my daughter over to his house for dinner with the other guys. He made a big-time play early in the second quarter, catching a 28-yard pass from Foles down the middle on a third-and-6, and taking a vicious shot in the ribs from McManis. Clearly in pain, he managed to make the first-down sign with his left hand, while holding his ribs with his right. “Once I realized I wasn’t coughing up blood or anything, I figured I was OK," he said with a smile. The fact that both Foles and Pederson trusted him on that do-or-die fourth-down play tells you a lot about how far Tate has come since the late-October trade. “There’s a lot of trust in the quarterback room," Tate said. “Doug and [offensive coordinator] Mike Groh and my position coach, to have confidence in and put me in that situation with the game on the line, that means a lot. “But that’s when I want the ball. That’s when I want to be able to make something happen. When it’s crunch time. I’m just happy I was able to do my part and help our team win. “I was a late addition. Came in late October. But it’s been fun." In their red-zone work in practice last week, the Eagles ran the game-winning throw to Tate several times. “That play was a focus this week," Ertz said. “They obviously have a really good front seven. It’s not easy to run the ball in the red zone, as we saw on the first two plays down there. “But we were able to get Nick on the perimeter. We moved the front so that the defense couldn’t just pin their ears back. “I don’t think Golden got covered on that route all week [in practice]. He was dominating on that route each and every time we called it." Foles threw two interceptions Sunday but was cool under pressure on the game-winning drive. “He’s a very calm, cool, collected guy," Tate said. “He understands the game. He wants to live in the now. He doesn’t put too much pressure on himself, or at least it doesn’t seem like it. “We’ve done a good job of gathering around him and following his lead. But it starts with him. “On the last play, he was cool Nick. He called the play. We looked at each other. Next thing you know, the ball was on its way and I had an opportunity to make a play."